PTP/NYC is known for presenting strong productions of their favorite playwrights. With so many rich scripts in the repertoire, it’s hard to choose which plays to produce. So why not bring a double bill! In a night of high-intensity drama, PTP/NYC brings you Judith by Howard Barker and Vinegar Tom by Caryl Churchill. At first glance you may not see a correlation between their pairing but these are two plays that, among other things, contain strong females characters. Very strong. First up is Barker’s Judith. A retelling of the Book of Apocryphya’s heroine Judith and her physical sacrifice to general Holofernes, Barker presents his version where he suggests a struggle where Judith loves with the enemy. Barker’s piece is intense and provocative to say the least. The struggle for power and the immense sexual tension of the play furtheres the action until madness ensues. Director Richard Romagnoli takes the intimacy of the piece and glorifies it in all the right ways. Romagnoli finds the edge and grit of Baker’s script and manages to excite and arouse. The cat and mouse game between Pamela J. Gray’s Judith and Alex Draper’s Holofernes was thrillingly wonderful. With clear objectives to start, watching Gray and Draper become flippant as the situation transformed kept the audience attentive. While the battle between Judith and Holofernes may have been the meat of the piece, it was Patricia Buckley who stole the show. Buckley is nothing short of phenomenal as The Servant. Buckley balanced immense humor and wit with impeccable timing to make the third wheel of the piece the star. It’s unfortunate that this prominently intimate piece was stuck upon the giant stage. With the confines of a double billing, Romagnoli and scenic designer Hallie Zieselman kept the space open despite using only half of the stage. Had there been a way to confine the space, the dangers of the piece would have grown vastly. The chairs and bed that Zieselman used for Holofernes tent were absolutely beautiful. The modern pieces were added a richness to the world. It’s unfortunate that the oriental throw rugs clashed with the modernity of these stunning pieces. In Vinegar Tom, Churchill writes about gender and oppression through the lens of the witch hunt in England. When Alice and her mother are accused of witchcraft by their neighbors, the village explodes with accusations as mishaps occur all throughout town. Director Cheryl Faraone takes the biting play and ensures that the message is clear. Churchill’s approach is not subtle and neither is Faraone’s. She keeps things active and makes the mystery of the truth unfold in a careful manner. Her staging involved many meandering bodies around the space, peering into the action. It’s possible it was calculated but there were moments that the specific bodies felt arbitrary. While Alice may have been the focal drive of the play, it was Bill Army’s Jack and Kathleen Wise’ Margery that were simply astounding. Army and Wise had immense chemistry drawing the most sympathy for their story. Both Army and Wise brought an array of emotion, but it was Wise who pulled on the heart strings. Nesba Crenshaw as Joan, the mother of Alice and accused witch, found ways to make you believe that perhaps she does know a thing or two about witchcraft. The verbal battles between the characters within the acting company is striking to watch. Even the physical altercations are forcefully real. The only issue that arises is the plethora of dialects on stage. It’s a bit unclear as to the exact location due to the inconsistency. Part of the intrigue of Vinegar Tom is the juxtaposition of song to story. Churchill writes some sharp lyrics to display the universality of the story. Faraone and composer Carol Christensen take the modern approach with the music. Stylistically the music works well. Christensen employs a hauntingly harmonious doo wop feel in the songs. Even the "Witchy Three Singers" played by Caitlin Rose Duffy, Joelle Mendoza, and Liana Barron bring extra life to the piece, though it’s Duffy who’s the Beyonce of the trio. And whenever you hear three singing witches and flashy lights, you can’t help but think of some ladies from a campy movie called “Hocus Pocus.” And the audience loved these three. But as jarring as the music is supposed to be, there was something off about it. And it came from their costumes. 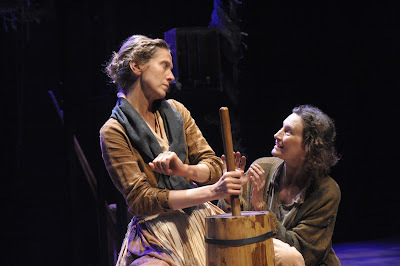 Costume designer Annie Ulrich did a stunning job clothing the townspeople of Vinegar Tom. But with Duffy, Mendoza, and Barron, it felt as if they walked into the theater and onto the stage in their street clothes. Perhaps if they blended into the world of the play, breaking out in “character”, there would have been a cleaner cohesiveness. Aside from this, the design of the piece is spectacular. The structure gets utilized in a wondrous way, storing the props yet giving glimpse of what is to come. The Judith and Vinegar Tom double feature is a night of high drama. It’s best to prepare yourself before taking your seat. But once you do, you’ll be glued to the action and storytelling that PTP/NYC is known for. Just another wonderful showcase for two strong theatrical voices.